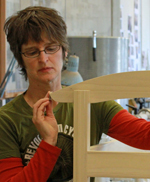 The daughter, granddaughter, and sister of carpenters, BA Harrington took the family woodworking legacy to another level in 1992 when she enrolled in the traditional Cabinet and Furnituremaking Program at the esteemed North Bennet Street School in Boston. After working for a decade as an independent, custom furniture maker, Harrington returned to academia and her studio art background. She graduated with an MFA in wood from the University of Wisconsin-Madison in 2007. Continuing as a graduate student in the Department of Art History, she earned a Master’s Degree and a Material Culture Certificate from UW-Madison in 2010. In 2012, after accepting an Assistant Professorship at Indiana University of Pennsylvannia, Harrington teaches advanced and beginning woodworking in the College of Fine Arts, and offers support to graduate student advisory committees. 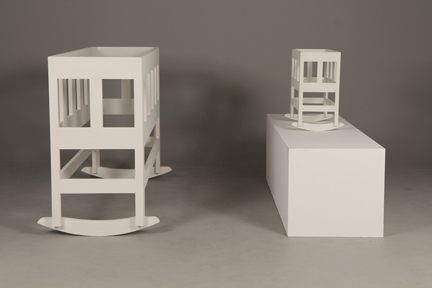 Harrington continues to write essays, speak at conferences, and build sculptural work in reference to early American furniture forms. Her new research interests include ways in which cognitive science can inform craft practices and curriculum.